With Spring Cleaning in full swing and #EarthDay on the way, now is the perfect time to think about getting some new eco friendly furniture that can earn you points toward LEED certification.  You can go green and save your company money. In order to get this certification, you need to earn a certain number of points. Your building earns these points by being constructed of certain LEED-approved materials, using certain LEED-approved appliances, and a lot of other ways. Your building can earn up to 100 points in six different categories, including Materials and Resources and Indoor Environmental Quality. So, yes, the furniture in your office can in fact contribute to your building’s LEED certification. There are four different LEED certification levels. First, there are the tax benefits. These vary widely, not just from state to state, but between municipalities as well, so it’s best to get in touch with your local tax officials to see what LEED-based incentives are available. California has nearly 200 incentives listed for energy use alone. Second, using products and materials that earn you LEED points can save a whole lot of money and energy. “Between 2015 and 2018, LEED-certified buildings in the United States are estimated to have $1.2 billion in energy savings, $149.5 million in water savings, $715.2 million in maintenance savings and $54.2 million in waste savings,” according to the U.S. Green Building Council. Amid rising concerns about humanity’s impact on the environment, it’s just good corporate practice, too. How Can My Furniture Earn LEED Points? Eco friendly furniture, or sustainable furniture, is a term used by a lot of manufacturers. Not all furniture with this label will actually earn you LEED points, though. Some of the elements crucial to LEED-certified furniture include a certain percentage of recycled material, or 50% of a piece of furniture’s wood being sourced from providers who operate in accordance with Forest Stewardship principles. 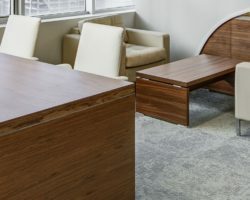 The good news is that an office furniture manufacturer will tell you if their products earn you LEED certification points, removing any guesswork. If you don’t see a LEED logo or any information about LEED standards on the product information sheet, that’s an indication that, though the furniture you’re looking at might be somewhat eco friendly, it may not adhere to LEED standards. When in doubt: ask. Help keep California green with Corovan. If you’re wondering what LEED-certified furniture looks like, we’ve got some office furniture examples for you right here. Not only is this table lovely, but it’s also made of 62% recycled materials, including the aluminum top and base and wood core, and it will indeed earn you LEED points. It’s hard to choose just one of these gorgeous wood veneer desks, which are a great reminder that “eco friendly” doesn’t have to mean “ugly”! Made of low-emitting materials, this collection is all certified by LEVEL, the organization that functions as the LEED equivalent for office furniture and works closely with LEED. These handsome open workspace benches are eligible for LEED points. The typical Power Beam product uses 100% recycled fabric and offers options like bamboo veneer, which can contribute to LEED’s rapidly renewable materials requirement. The great thing about the Echo is that you’ve got plenty of options—from buoyant colors to chic wood laminates. Not all of these options will earn you LEED certification points, though, so be sure to check with your salesperson. 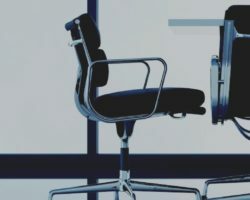 The post: “Eco friendly Furniture Options For Your Office” was originally published in August 2016 and has been completely revamped and updated for accuracy and comprehensiveness. Join 8,674 facilities professionals and get the latest tips and updates delivered straight to your inbox! !